The really exciting news is in the monthly usage numbers. 2011 beat every month of the previous two years, often with large gaps. The resource is being used because the resources is available. 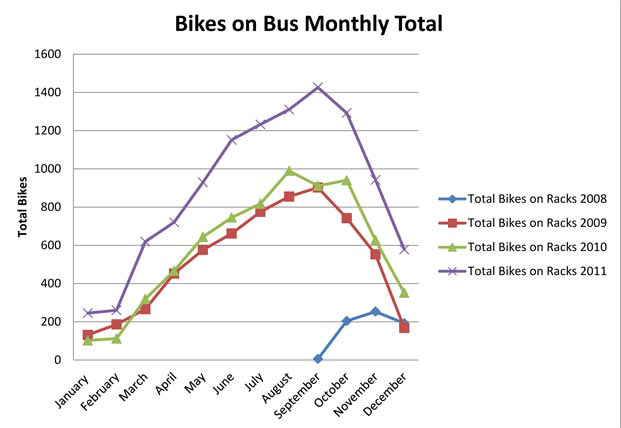 The site of a bike on a bus has become normal. 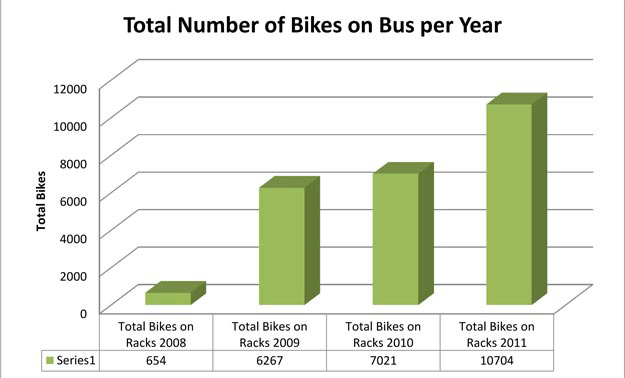 KETV News, here in Omaha, did an excellent story on how the bike racks on the buses offers “more connections” for Omaha cyclists. While the numbers are nowhere near that of the automobile, they show an increase in choice of a particular combination of modes. This represents real improvement in mobility for the people of Omaha. If you look at the Alliance for Biking and Walking’s 2012 Benchmarking Report, you can see that Omaha is improving and ranks well with many cities of larger size and longer histories of bike/pedestrian/transit projects.